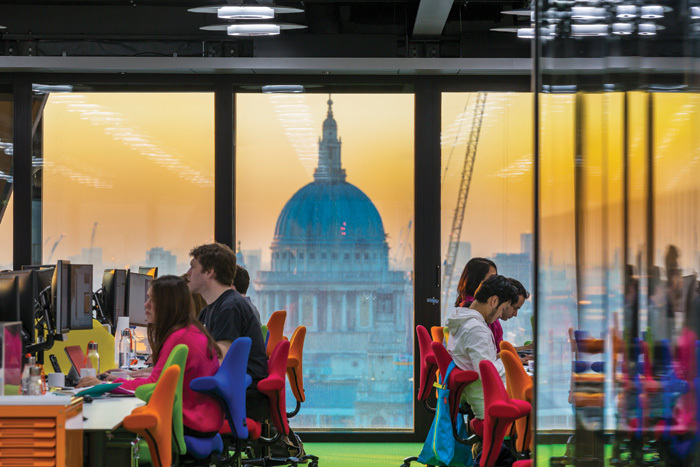 You can still see the river from the new offices of Rogers Stirk Harbour + Partners (RSHP) that the practice has designed for itself, but not like you could from its old five-floor offices at Thames Wharf Studio in Hammersmith. Now, from level 14 of the Leadenhall Building (universally known as the Cheesegrater), fragmented patches of the Thames are peeked east and west, rather than the stretch languidly flowing past the leafy old footpath on the opposite bank that the practice saw for 30 years. Thames Wharf was a local landmark with its 1991 barrel-roof extension designed by Lifschutz Davidson Sandilands. The 225m-high Leadenhall Building is an internationally recognised landmark, designed by RSHP. 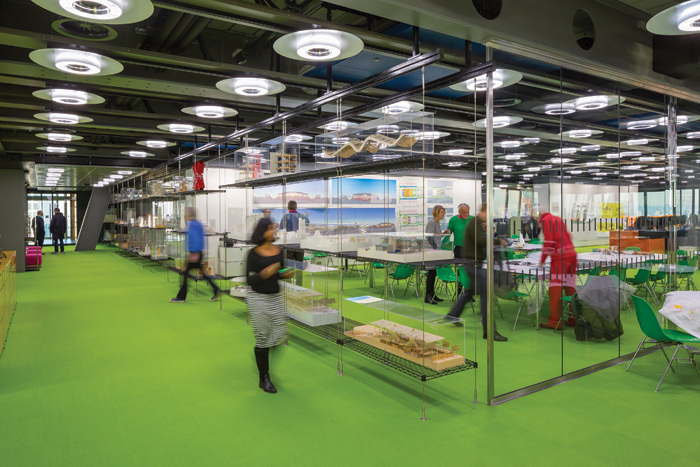 According to project manager Maurice Brennan, the green carpet-tiled floor, with its instant colourful brightness characteristic of so many RSHP projects, ‘echoes the green of the Thames Wharf environment’. The new 1,672 sq m floor accommodates 200 staff, and leverages the huge unbroken floor plate that the wedge-shaped volume offers. Entering from the panoramic lifts in the tower’s adjacent north facing service slab made of structural yellow tables (Blueprint 325, April 2013), you find no reception desk but some seating and two screens, showing RSHP films, facing a glass wall with three shelves displaying architectural models. This stretches towards the southern facade, into the wide realm of the studio floor occupying most of the space and, beyond it, the facade facing south to the roof structures of Rogers’ Lloyd’s Building (1986). Some 50m of magnetic whiteboard walls separate rooms, including two main meeting rooms opposite the model shelves, on the north side of the studio. The computer that drives everything is visible behind glass, near the model room. Still, this is no organic drop-in space with comfy sofas like today’s trendy office interiors for start-ups (see Airbnb’s Aaron Taylor Harvey innovation interview p134). The layout is rigorously rectilinearly ordered. The studio spreads to three facades around a central cafe area behind glass walls, with enhanced audio/visual facilities for presentations. Bespoke desking is by Dutch firm Ahrend, whose 1500mm x 800mm units join to form lines. Twice as many screens as at Thames Wharf rise above them, and HÅG Capisco chairs in bright primary colours sit at them. On the east and west corners, the studio gives way to semi-formal, unpartitioned spaces where you can sit around round tables and enjoy the views - but no sofas. The long-standing Rogers high-tech ethos that shows off the whole building’s structure externally comes into the interior in the ceiling, and again, Arup was the engineer. The building specifies a 2.75m ceiling height, which anchor tenant Aon and those that followed conform to. But on RSHP’s floor the space above the lighting is opened up, exposing M+E and enhancing height to the concrete floor panels 3.7m above. Blue acoustic screens cover fan-cool units. As for the lighting by Spectral Designs, which incidentally dispenses with the need for any on desks, circular LED lamps are mounted on tracks along the beams and subtly change colour in sync with daylight cycles. The design was by Speirs + Major, which worked on RSHP’s Barajas Airport and Maggie’s Centre in London. The office design began in January 2015, and RSHP quit Hammersmith before Christmas. Space was fragmented there, and Harbour felt the practice was ‘in the middle of nowhere’. After considering other sites to consolidate in, including the South Bank’s Sea Containers House, it is now in its own building - a great advertisement to clients - and in the City of London. While he acknowledges the connotations and being in ‘a corporate office building’, partner Graham Stirk sees that ‘the City is coming to life, becoming more diverse. London has to evolve to be relevant. The City needs to remain dynamic’. Meanwhile, back upriver in Hammersmith, the old offices await redevelopment. RSHP has gone, but leaves an echo in its replacement design - new apartments will rise nine storeys under a barrel-shaped roof, like it once worked under.